Prominent & Leading Manufacturer of FRP Fratings, we offer frp gratings and frp cable trays. Among our wide range of products, we are introducing a premium quality assortment of FRP Moulded Gratings. 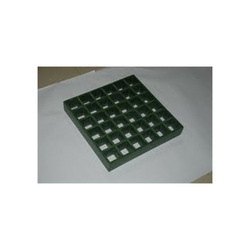 These gratings are widely used in various industries for ensuring chemical resistance over different corrosive environment. Our grating is accessible in different specifications in order to satisfy the need of the clients across the nation. Offered grating is acknowledged for offering advanced solutions against critical problem of corrosion. Looking for FRP Gratings ?